I am helpless in the face of sliders of any kind. There’s something so cute about their bite-sized-ness that gets me every time. They usually come in burger or meatball or chicken form, though, and I thought it was high time the crab cakes got their turn. Little teeny versions of crab cakes sitting on Boston bibb lettuce with a small dollop of tartar sauce, all on a small soft roll. Am I right? I think I’m right. About that roll – you can use dinner rolls, or you can cut hot dog rolls in thirds, or some supermarkets are even carrying slider-sized rolls now. But the Southern husband has become obsessed lately with Hawaiian rolls. They are a little hard to track down, but click here to take a look at them. They are soft and just a little bit sweet, and they were perfect with the little baby crab cakes. Back at the crab cakes, mix up some lump crabmeat with some mayo, crushed potato chips, a little Dijon mustard and Old Bay seasoning and an egg. Mix it all up and form it into little slider sized crab cakes. Now, I like to bake my crab cakes instead of frying them. You bake them on a cookie sheet, and among other things it eliminates that terrifying step of having to flip them, which can result in crab cake breakage, which can result in weeping in the kitchen. 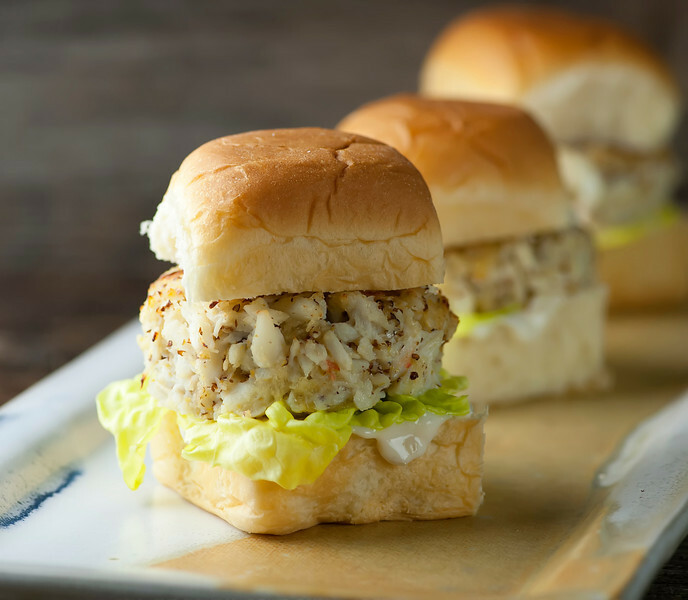 Once the crab cakes are out of the oven, spread a little tartar sauce on the bottom of your slider roll and pop on a small piece of lettuce. Place the crab cake on the lettuce, top it with the other half of the slider roll and you are all set! We found that two of these made a nice light supper, but if you twisted my arm just a little I might be able to eat three. Hurray for sliders! Preheat oven to 375 and line a cookie sheet with nonstick foil. Mix together crabmeat, mayo, chips, mustard, Old Bay, egg and salt and pepper. Form into 8 small crabcakes and place on cookie sheet. Bake for 10 minutes or until set. Spread some tartar sauce on the bottom of each slider roll and top with a piece of lettuce. Place a crabcake on each one and top with the other half of the roll. Serve at once. I’ve been trying to think outside the box for a more tropical Memorial Day menu (I’m in FL) and I do believe you’ve solved the issue for me, thanks so much! !